In 2009, I was asked to replicate the entrance in this photograph. 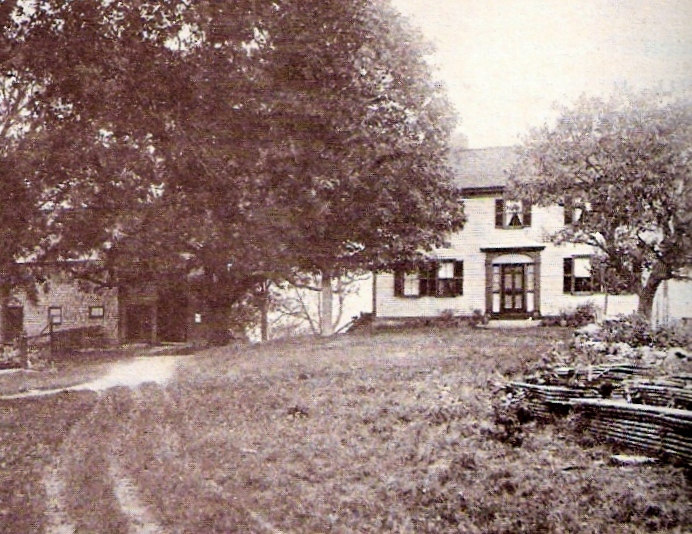 The house in Reading, Massachusetts, c. 1795, had lost the original front door, fanlight, columns and architrave in the 1950's. 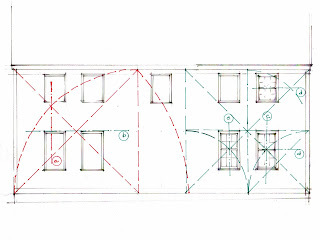 I found then that the regulating lines of the house told me what the dimensions of the entrance should be and determined the curve of the fanlight. Recently I realized I had not looked at the placement of the windows in this house. I wondered if the proportions here would match those of the Locke Tavern. The basic pattern is similar: a square on each side of the front door, the entry dimension determined by the diagonal ( the Root 2 Rectangle). The windows for both houses are balanced around the center of the squares. Did the master carpenters, the house wrights, use the same regulating lines? Not quite. The Locke Tavern elevation shows the diagonal and the arc marking the center line for the windows. The Reading house elevation shows that the intersection of those lines - 'a' in red on the left side - doesn't seem to mark anything. However, the square divided in half -'b' in green on the left side - determines the top of the windows. The intersection of the two falls is the vertical center line for the width of the windows - 'c' in green on the right side. Then notice how the horizontal center line - 'd' in green on the right side - determines the center line for the height of the windows, both on the first and second floors. The settlers in Reading came from Berkshire, England. They named their new town after Berkshire's county seat.The settlers in Andover, 10 miles north and the location of the Locke Tavern, came from Hampshire, England, the county next door to Berkshire. Did they have different framing traditions? Could the house wrights have come from other parts of England and been trained in other layout methods? Or did the method for designing the 1740 elevation in Andover evolve over 55 years to produce the elevation in Reading in 1795? I inch along with this...finding the lines for one building, then finding the next building uses the geometry differently. I think I've solved a riddle, but discover another. I have deliberately focused on designing (layout), not framing - although I am quite sure they are intertwined. I do trust my eye. I feel the proportions. When I find the lines that validate that feeling I laugh! Joy! I post so that others can see the ideas and continue the exploration. 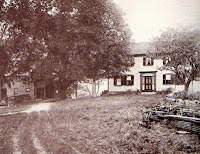 To read more about that design see my '1795 House' posts from late 2009 through early 2010. 12/31/15: I have corrected my post. The ratio used here is often referred to as the Root-Two Rectangle as it derives from the diagonal of a square. I doubt the carpenters laying out this work used that name - it's cumbersome. Unfortunately we do not know what they called that ratio or any of the others. I believe you may have made an error in your analysis. You state "The basic pattern is similar: a square on each side of the front door, the entry dimension determined by the diagonal, the Golden Section ratio." 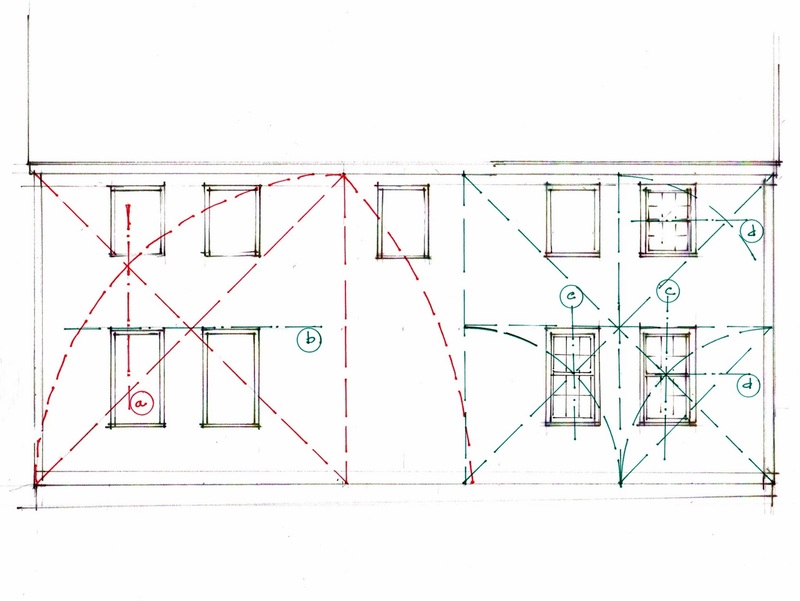 I believe that your analysis shows the window placement uses the Root Ratio (1.414) and not the Golden Ratio (1.618). Thank you for teaching us about the geometry used in laying out these buildings. Here you are again. Liam Fryers! Reading carefully and catching my errors. Thank you. I did catch it later but forgot to go back and correct old posts. Beside my drafting board are diagrams of the root 2 rectangle, the Golden Section and the 3/4/5 triangle. I posted them as references for when I am working out a geometry and wondering what it is I am seeing. The ratios are not as useful in my work as are the degrees of the angles. I think the people who used this geometry did not think about the ratios as numbers. I think they 'spoke' geometry, not necessarily mathematics.